“Are workaholics born or made?” The current research aims to answer the question above, while investigating the joint impact of internal and external factors (Work Drive and Work Enjoyment) related to workaholism's dimensions. In Study 1, we hypothesize an order of precedence between those dimensions, utilizing one moderator (Job Autonomy) and one mediator (Work-Family Conflict - WFC) (158 employees). Study 2 (349 employees) expands the general framework, taking two moderators (Self-Criticism and LMX) into consideration. Multivariate (vs. bivariate) analyses allowed more thorough understanding of workaholism and its dimensions. We offer theoretical and practical implications. “¿Los adictos al trabajo nacen o se hacen?” Este trabajo trata de contestar dicha pregunta investigando la repercusión conjunta de factores internos y externos (la motivación por el trabajo y el disfrute del mismo) en relación a las dimensiones de la adicción al trabajo. En el estudio 1 se plantea la hipótesis de un orden de precedencia entre esas dimensiones usando un moderador (la autonomía en el puesto de trabajo) y un mediador (el conflicto trabajo-familia) en una muestra de 158 empleados. El estudio 2, en una muestra de 349 empleados, amplía el marco general teniendo en consideración dos moderadores (autocrítica e intercambio líder-subordinado). Los análisis multivariable (en relación a los bivariable) permitieron una mayor comprensión de la adicción al trabajo y de sus dimensiones. Por último, se abordan implicaciones teóricas y prácticas. Oates (1971) coined the term Workaholism and defined the phenomenon as “an addiction to work, the compulsion or uncontrollable need to work incessantly” (Oates, 1971, p. 11). Oates noted that workaholics’ need to work becomes exaggerated and may cause harm to their health, personal happiness, interpersonal relations, and social functioning. In a later discussion of the term, Spence and Robbins (1992) regarded workaholism as an addiction. They noted that “the workaholic feels driven or compelled to work, not because of external demands or pleasure in work, but because of inner pressures that make the person distressed or guilty about not working” (p. 161). Since Spence and Robbins (1992), there have been many papers in the academic literature devoted to workaholism (e.g., Andreassen, Griffiths, Hetland, Kravina, Jensen, & Pallesen., 2014; Patel, Bowler, Bowler, & Methe, 2012; Schaufeli, Taris, & Van Rhenen, 2008). Most researchers agree upon workaholism's core behavioral manifestation, namely, heavy investment in work (Scott, Moore, & Miceli, 1997; Snir & Harpaz, 2015; Spence & Robbins, 1992). That is to say, workaholics spend many hours a week on work-related activities when given the opportunity to do so (Snir & Zohar, 2008) and much beyond what is required or expected by colleagues or organizational demands (Scott et al., 1997). Of note, workaholism has frequently been considered as comprising a multi-dimensional structure (for an in-depth review, see Andreassen, 2015). This paper will also adhere to the multi-dimensional structure of this concept. Spence and Robbins (1992) offered the first multi-dimensional definition of workaholism. They prescribed three dimensions and dubbed them the ‘Workaholism Triad’ – Work Involvement, Work Drive, and Work Enjoyment. Work Drive constitutes the inner pressures that compel the employee to work, while Work Enjoyment is the pleasure derived from the work itself. The Involvement dimension refers to the commitment of employees to their work and time invested in it (see Spence & Robbins, p. 161). In contrast to the negative side, other studies have emphasized the positive aspects of the drive to work. They saw it as a dispositional motive that causes enthusiasm and passion in one's work behavior, perceiving it as a source of pleasure, self-fulfillment, and existential meaning (p. 370). In light of past literature, we noticed that the Triad's dimensions (Drive, Enjoyment, and Involvement; Spence & Robbins, 1992) are consistently deemed theoretically independent of each other (see Graves, Ruderman, Ohlott, & Weber, 2012; McMillan, Brady, O’Driscoll, & Marsh, 2002; Spence & Robbins, 1992). It is important to note that throughout the literature the Drive and Enjoyment dimensions are deemed the most consistent, while research has failed to confirm the relevance of the Involvement dimension (e.g., Andreassen, Hetland & Pallesen, 2012; McMillan et al., 2002). One reason is that the definition of involvement has terminological collinearity with organizational commitment (for further review, see Scott et al., 1997, p. 290) and the latter dimension, i.e., organizational commitment, was considered, overall, an invalid dimension (Andreassen, Griffiths et al., 2014). Thus, this research focuses specifically only on the Drive and Enjoyment dimensions. Concerning the associations between Work Drive and Work Enjoyment, there have been some inconsistencies: several researchers have found significant positive relationships (Burke, Matthiesen, & Pallesen, 2006; Clark, Michel, Zhdanova, Pui, & Baltes, 2014; McMillan et al., 2002), while others have found close-to-zero relationships (Andreassen, Hetland, & Pallesen, 2010; Spence & Robbins, 1992). It is vital to emphasize that in these studies the authors obtained results by employing correlational methodology (post factum, in the correlation matrices) and not by establishing a priori confirmatory hypotheses. These inconsistencies lead us to believe that the relationship between Drive and Enjoyment is most probably regulated by other, indirect variables (mediators, moderators). Faced with these inconsistent findings, we reassert that the goal of the present paper is to test the dimensionality of workaholism and its relations with internal and external factors. The medium for achieving this objective is a test of a broader theoretical framework that incorporates the Drive and Enjoyment dimensions, including antecedents, moderators, mediators, and outcomes. We aim to show that Work Drive – at times regarded as being “intrinsically bad” because of its potentially negative outcomes (Schaufeli et al., 2009, p. 325) – may have positive outcomes as well (i.e., Enjoyment). In other words, “Out of the strong, came forth something sweet” (Judges 14:14). By doing so, we will try to unveil potentially important variables, which can be used for organizational interventions, in order to bring something “sweet” “from something “strong”. This research is built upon two separate studies, whereby the second study is additive to the first in terms of the conceptual framework, namely, it serves as a test of the association between Work Drive and Work Enjoyment and its relations with other internal and external factors. We split our research into two separate studies due to the large amount of variables overall (see Figure 3). Had we incorporated them all into one study, from the perspective of the respondents, survey completion would have been overly burdensome. This approach of breaking down a global research project, comprising a large number of factors, into sub-studies is supported by previous studies (e.g., Chernyak-Hai & Tziner, 2012; Sharoni, Shkoler, & Tziner, 2015). Overall Model for both Study 1 and Study 2. Note. Solid lines indicate variables from study 1, while broken lines indicate variables from study 2; WFC=Work-Family Conflict; LMX=Leader-Member Exchange; SC=Self-Criticism. Before elaborating on the said variables and associations, we wish to focus specifically on the relationship between the Drive and Enjoyment dimensions. As far as we know, testing the notion that Work Drive precedes Work Enjoyment has yet to be determined on a solid theoretical basis. This relationship stands in the center of our framework (see Figure 3), and as such is of paramount importance. Work Drive can be considered as an uncontrollable internal need (Taris, Schaufeli, & Shimazu, 2010), which may override preventive motivational focus (Taris, van Beek, & Schaufeli, 2015) – the prevention of unpleasant feelings when not working. This proposition is supported by Ng, Sorensen, and Feldman's (2007) research that demonstrated that the act of working assuages the associated unpleasant feelings when not working, such as anxiety, helplessness, depression, and/or guilt (see also Spence & Robbins, 1992; Beek, Hu, Schaufeli, Taris, & Schreurs, 2012; Andreassen, Griffiths, Hetland, & Pallesen, 2012). Therefore, the act of working might play a role as a mood modifier, which is an important component of any addiction (Andreassen et al., 2012; Griffiths, 2005), namely, working in order to escape or avoid dysphoria. H1: Work Drive will be correlated with Work Enjoyment. For the purpose of the study, we chose three variables to relate to the Work Drive and Work Enjoyment dimensions. These were: (a) Emotional Instability (emotional instability), which we chose due to its negative affect and the possibility of mood modification (see explanation below); (b) Work-Family Conflict, for the possible behavioral manifestation of Work Drive (i.e., working for many hours); and (c) Job Autonomy, an important interventional factor an organization may employ, which can have an impact on work characteristics. Emotional instability is the tendency to experience negative emotions, such as anger, anxiety, low self-esteem, depression, impulsivity, mood swings, emotional instability, insecurity, and high vulnerability to stress (Djurkovic, McCormack, & Casimir, 2006). This concept is a part of the Five Factor Model (FFM) of personality, commonly known as the Big Five, and is often referred to as ‘emotional instability’. Emotionally instable individuals are emotionally unstable personalities who experience less positive affect, subjective well-being, and life satisfaction (Olesen, Thomsen, & O’Toole, 2015). H2: Emotional instability will be positively correlated with Work Drive. H3: Emotional instability will be negatively correlated with Work Enjoyment. Behavior-based conflict, which refers to incompatibility between the desirable behavior-patterns in two competing domains (e.g., an individual at work may be expected to be ambitious, and task-oriented to perform well. In contrast, the expectation at home is that the same individual be loving, supportive, and accommodating (Dewe et al., 2010). H4: Work Drive will be positively correlated with WFC. H5: WFC will be negatively correlated with Work Enjoyment. H6: WFC will mediate the relationship between Work Drive and Work Enjoyment (as H1, H4, and H5). Job autonomy reflects the extent to which a job allows discretion, freedom, and independence in scheduling work or allowing employees to decide and select the methods (how and when) used to execute their tasks (Hackman & Oldham, 1975). Park and Searcy (2012) have demonstrated that, in contradistinction to less autonomous employees, autonomous workers possess an intrinsic drive to work, are more satisfied and productive in their jobs, and have higher commitment and retention levels. H7: Job autonomy will moderate the relationship between Work Drive and WFC. The participants were 158 Israeli employees of various organizations (e.g., services, high-tech, etc. ), 20.3% males and 79.7% females, between the ages of 25 and 63 (M=33.80, SD=6.77), who have children between 0 and 5 years old (M=1.76, SD=0.95); 10.8% of the sample had high school diplomas, 16.5% had tertiary/vocational education, and 72.8% had an academic degree; 34.8% held managerial positions and 65.2% did not hold managerial positions. We distributed an electronic version of the research questionnaire to workers in various organizations, utilizing both email and Facebook platforms. Those who wished to participate replied that they did, and were included in the total sample. Emotional Instability (neuroticism) was assessed using the Big Five Inventory (BFI; John & Srivastava, 1999), which consists of 44 Likert-type items. However, in the present study only emotional instability was examined, using only eight items, ranging from 1 (strongly disagree) to 6 (strongly agree) – e.g., “I worry a lot” – while three of the items were reverse-coded. In the present study, there was an adequate reliability (α=.77, M=2.78, SD=0.65). Job autonomy was assessed using the Work Design Questionnaire (WDQ; Morgeson & Humphrey, 2006), which consists of 77 Likert-type items, ranging from 1 (strongly disagree) to 6 (strongly agree). For the current study, we chose nine items that indicated job autonomy, e.g., “The job allows me to plan how I do my work”. The original Cronbach's alpha of the measure was .86 (Morgeson & Humphrey, 2006). In the present study, there was a high reliability (α=.93, M=4.45, SD=1.62). Work-family conflict was assessed using the Work-Family Conflict Scale (Netemeyer, Boles, & McMurrian, 1996), consisting of five Likert-type items ranging from 1 (strongly disagree) to 6 (strongly agree). Original Cronbach's alpha of the scale was .88. In the present study, there was a high reliability (α=.94, M=3.70, SD=1.60). Workaholism was assessed using the Workaholism Battery (Work-Bat; McMillan et al., 2002). The battery consists of 21 Likert-type items ranging from 1 (does not describe my work at all) to 6 (describes my work exactly). Seven of these items measure the Enjoyment factor of workaholism, (e.g., “I like my work more than most people do”), and seven measure the Drive factor of workaholism, (e.g., “I feel guilty when I take time off work”). The other seven items measure the Involvement factor, but they were not included in the present study. Cronbach's alpha of the Enjoyment and Drive factors, respectively, were .88 and .73 (Huang, Hu, & Wu, 2010). In the present study, there was an adequate reliability for Work Enjoyment (α=.88, M=2.63, SD=0.98) and for Work Drive (α=.79, M=3.35, SD=0.78). In order to test for common-method bias (CMB), we employed Harman's single factor test (see Podsakoff, MacKenzie, Lee, & Podsakoff, 2003). Our single-factor explained 25% of the variance, and as such is not considered to have CMB problems (criterion for CMB problems is R2> 50%). Using AMOS (v. 22) we tested our model's fit: χ2(1)=9.10, p=.003, χ2/df=9.10, SRMR=.07, CFI=.87, GFI=.97, NFI=.87, RMSEA (LL-UL, CL=90%)=.23 (.11-.37), p=.009. This indicates the model fits the data only relatively (Byrne, 2010). We performed Pearson correlations and hierarchical linear regression analyses, in order to test the model and hypotheses. Table 1.1 presents the correlations among the study's variables. Pearson Correlation Matrix for Study 1 (N=158). Note. E. Ins=Emotional Instability; J-A=Job Autonomy; WFC=Work-Family Conflict; W-E=Work Enjoyment; W-D=Work Drive. Table 1.1 indicates no statistically significant correlation between Drive and Enjoyment dimensions of workaholism (r=.01, p=.455), rejecting H1. There is also a positive correlation between N and Work Drive (r=.22, p=.003), but negative between N and Work Enjoyment (r=-.32, p=.000), while supporting H2, and H3. There is also a positive correlation between Work Drive and WFC (r=.33, p=.000), while WFC is negatively correlated with Work Enjoyment (r=-.32, p=.000), supporting H4 and H5. When Job Autonomy is low (-1 SD from the mean), the effect of Work Drive on WFC is near-zero (β=-.05, p=.452). 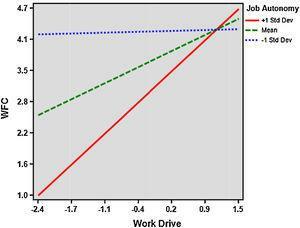 When Job Autonomy is moderate (0 SD from the mean), the effect of Work Drive on WFC is positive (β=.21, p=.001). When Job Autonomy is high (+1 SD from the mean), the effect of Work Drive on WFC is positive and strong (β=.47, p=.000). Thus, the higher the Job Autonomy, the stronger is the impact of Work Drive on WFC. Standardized Regression Coefficients and Model Summaries for Predicting WFC. Note. W-D=Work Drive; J-A=Job Autonomy; WFC=Work-Family Conflict; INT=interaction effect of W-D×J-A. Interaction Graph (Job Autonomy as moderator). Model for H2 and H3. Model for H4, H5 and H6. Research model for Study 2. We also used AMOS (v. 22) to test the mediation model (H6) presented in Figure 1.4, albeit not all the conditions for mediation were met (see Warner, 2013). This has led us to further investigation. Research model for Study 1. Note. WFC=Work-Family Conflict. 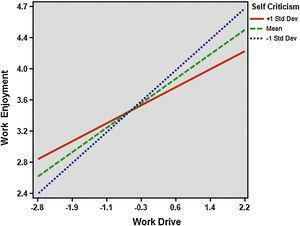 At the bivariate level, there was a near-zero correlation between Work Drive and Work Enjoyment (r=.01, p=.455), as per H1. Nevertheless, when testing the model as a whole (see Figure 1.4 and Table 1) at the multivariate level, we found the relationship between Work Drive and Work Enjoyment to be significant (β=.17, p=.032). This has led to further investigations of the relationships among the variables. To make sure of what was confounding our results, we utilized a hierarchical regression analysis to test the mediation model. We noticed, however, that instead of decreasing the direct association between Drive and Enjoyment (as would be expected from the mediator), WFC actually increased this relationship (when added in a second step of the hierarchical regression, after Work Drive). We concluded, therefore, that WFC functions as a suppressor variable, increasing the predictive validity of Work Drive on Work Enjoyment de facto. The classical definition states that a suppressor variable has no relationship with the criterion yet, nonetheless, the suppressor variable increases the correlation between the independent variable and the criterion (Pandey & Elliott, 2010; Tzelgov & Henik, 1991). However, a suppressor is defined by its effects on other variables, and may or may not be related to the criterion (see Pandey & Elliott, 2010). In actuality, the suppressor variable suppresses the outcome-irrelevant variance (“noise”) of the predictor on the criterion, thus “clearing” the explained variance by the said predictor. Such a unique effect cannot be seen in simple bivariate analyses; consequently, we employed a hierarchical regression (for further reading, see Pandey & Elliott, 2010; Tzelgov & Henik, 1991). Furthermore, we agree with Paulhus, Robins, Trzesniewski, and Tracy (2004) who argue that a better term for a suppressor variable is “enhancement variable” (p. 303). These considerations led us to the question as to why WFC acts as a suppressor variable on the Drive-Enjoyment relationship. To resolve this entanglement further, we provide a theoretical explanation (see discussion section). For the purpose of Study 2, we chose two factors: Self-Criticism (internal) and Leader-Member Exchange, LMX (external). Self-Criticism is reminiscent of Emotional instability as an internal personality disposition because of its negative characteristics and the possibility of mood modification (see explanation below). Furthermore, as far as we know, Self-Criticism has not been scrutinized at all concerning its relationship to Work Drive or Work Enjoyment. Moreover, based on the Social Exchange Theory, SET (Blau, 1964), we chose LMX, since a healthy manager-employee relationship potentially provides the worker with a supportive framework that cultivates productive work conditions. As such, it is an important interpersonal factor (dimension) the organization may exploit, because this positive dyadic relationship may bring something “sweet” (Work Enjoyment) out of something “strong”(Work Drive). Self-critical individuals are highly likely to experience agitation-related emotions, and they are characterized by “intense feelings of inferiority, guilt, and worthlessness and by a sense that they have failed to live up to expectations and standards” (Blatt, D’Afflitti, & Quinlan, 1976, pp. 383-384). They expect too much from, and feel bad about, themselves, while having little personal confidence (Chang, 2008). H8: Self-criticism will moderate the relationship between Work Drive and Work Enjoyment. Notably, we hypothesize no direct associations between self-criticism and Work Drive or Work Enjoyment (see explanation in Appendix). Nested inside the framework of Social Exchange Theory (SET; Blau, 1964), LMX theory focuses on the dyadic exchanges between leaders and followers (Graen & Uhl-Bien, 1995). We recognize a high-quality relationship (i.e., high LMX) by a high level of instrumental support, such as information exchange, guiding, and numerous rewards, and emotional support, such as mutual trust and influence, respect, loyalty, and fondness. A low-quality relationship is characterized by a poor level of trust, formal relations, one-directional influence, limited support, low levels of interactions, and fewer rewards. Accordingly, in low LMX, we expect the manager's relationship to the employee to be high in supervision and less personal in nature (Asgari, Silong, Ahmad, & Abu Sama, 2008). H9: LMX will moderate the relationship between Work Drive and Work Enjoyment. We hypothesize no direct associations between LMX and Work Drive or Work Enjoyment (see explanation in Appendix). The participants were Israeli 349 employees of various organizations (e.g., services, high-tech, etc. ), 24.9% males and 75.1% females between the ages of 20 and 67 (M=27.04, SD=7.04), who had between 12 and 20 years of education (M=13.37, SD=1.81); 73.1% of the incumbents were single, 24.1% married, and 2.9% divorced; 22.3% held managerial positions, and 77.7% did not hold managerial positions; 94.6% were salaried employees, while 5.4% were freelancers. We sent the electronic version of the research questionnaire to workers in various organizations utilizing both email and Facebook platforms. Those who wished to participate replied that they did, and were included in the total sample. Self-criticism was assessed using the Depressive Experiences Questionnaire (DEQ; Blatt, D’Afflitti, & Quinlan, 1979), consisting of 17 Likert-type items ranging from 1 (strongly disagree) to 6 (strongly agree), of which 8 items were reverse-scored (e.g., “I often find that I don’t live up to my own standards or ideals”). The original DEQ measured three constructs: dependency, self-criticism, and efficacy. For the purposes of the current study, we chose only the self-criticism factor, based on a former questionnaire (Blatt et al., 1976). Cronbach's alpha of the SC varied between .70 and .93 (see Campos, Besser, & Blatt, 2011). In the present study, there was an adequate reliability (α=.71, M=2.92, SD=0.59). LMX was assessed using a 7-item questionnaire (LMX7; Graen & Uhl-Bien, 1995), on a 6-point Likert-type scale ranging from 1 (almost never) to 6 (always), e.g., “Do you usually know how satisfied your leader is with what you do?” In a recent study, Cronbach's alpha of the questionnaire was .87 (Gu, Tang, & Jiang, 2015). In the present study, there was an adequate reliability (α=.85, M=4.18, SD=0.88). Workaholism was assessed using the Workaholism Battery (Work-Bat; McMillan et al., 2002). The battery consists of 21 Likert-type items ranging from 1 (does not describe my work at all) to 6 (describes my work exactly), 7 of which measure the Enjoyment factor of workaholism (e.g., “I like my work more than most people do”), and 7 measure the Drive factor of workaholism (e.g., “I feel guilty when I take time off work”). The other items measure the Involvement factor, but they were not included in the present study. Cronbach's alpha of the Enjoyment and the Drive factors were .88 and .73, accordingly (Huang et al., 2010). In the present study, there was an adequate reliability for Work Enjoyment (α=.79, M=3.63, SD=0.93) and for Work Drive (α=.75, M=3.76, SD=1.02). In order to test for common-method bias (CMB), we employed Harman's single factor test (see Podsakoff et al., 2003). Our single-factor explained 14.92% of the variance, and as such is considered to have no CMB problems (the criterion for CMB problems is R2> 50%). Using AMOS (v. 22) we tested our model's fit: χ2(6)=6.04, p=.645, χ2/df=0.75, SRMR=.03, CFI=1.00, GFI=.99, NFI=.96, RMSEA (LL-UL, CL=90%)=.00 (.00-.05), p=.942. This indicates an absolute fit of the model to the data (Byrne, 2010). We employed Pearson correlations and hierarchical linear regression analyses in order to test the model and hypotheses. Table 2.1 presents the correlations among the study's variables. Pearson Correlation Matrix for Study 2 (N=349). Note. SC=Self-Criticism; LMX=Leader-Member Exchange; W-E=Work Enjoyment; W-D=Work Drive. Table 2.1 indicates a statistically significant and positive correlation between Work Drive and Work Enjoyment (r=.41, p=.000), thus supporting H1 from study 1. When Self-Criticism is low (-1 SD from the mean), the effect of Work Drive on Work Enjoyment is positive and strong (β=.50, p=.000). When Self-Criticism is moderate (0 SD from the mean), the effect of Work Drive on Work Enjoyment is positive and moderate (β=.40, p=.000). When the Self-Criticism is high (+1 SD from the mean), the effect of Work Drive on Work Enjoyment is positive and moderate (β=.30, p=.000). Thus, the less an individual criticizes oneself, the greater the effect of one's Work Drive on Work Enjoyment is. This supports H8. Standardized Regression Coefficients and Model Summaries for Predicting W-E. Note. W-D=Work Drive; W-E=Work Enjoyment; SC=Self-Criticism; INT=interaction effect of W-D×SC. p < .05, **p < .01, ***p < .001. Interaction Graph (Self-Criticism as moderator). When LMX is low (-1 SD from the mean), the effect of Work Drive on Work Enjoyment is positive and strong (β=.56,p=.000). When LMX is moderate (0 SD from the mean), the effect of Work Drive on Work Enjoyment is positive and strong (β=.40, p=.000). When LMX is high (+1 SD from the mean), the effect of Work Drive on Work Enjoyment is positive and moderate (β=.24, p=.000). Thus, the higher the quality of LMX, the more the effect of Work Drive on Work Enjoyment is diminished; while on low LMX, higher Work Drive would lead to increased Work Enjoyment. Note. W-D=Work Drive; W-E=Work Enjoyment; LMX=Leader-Member Exchange; INT=interaction effect of W-D×LMX. Interaction Graph (Leader-Member Exchange, LMX, as moderator). The purpose of the current study was to test the dimensionality of workaholism and its relations with internal and external factors (see Figure 3), as these relationships had received little theoretical attention (Mazzetti, Schaufeli, & Guglielmi, 2014). 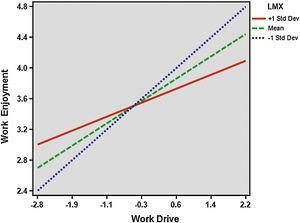 We found that: (1) Work Drive did not correlate with Enjoyment at the bivariate level in study 1, but Work Drive did correlate with Enjoyment at the bivariate level in Study 2; (2) Emotional Instability positively correlated with Work Drive; while (3) it negatively correlated with Work Enjoyment; (4) Work Drive positively correlated with WFC; while (5) WFC negatively correlated to Enjoyment; (6) No mediation of WFC between Work Drive and Enjoyment was found due to a suppression effect of WFC (see below); (7) Job Autonomy increased the effect Drive has on WFC; (8) Self-Criticism diminished the effect Drive has on Enjoyment; and (9) LMX diminished the effect of Drive on Enjoyment. Among the many papers devoted to the Drive and Enjoyment dimensions (e.g., Burke et al., 2006; Spence & Robbins, 1992) and, of significance, Mudrack (2006) and Schaufeli et al. (2009) demonstrated that the Drive component is more consistent, essential, and central than the Work Enjoyment dimension. However, throughout the literature, there has been a notable inconsistency regarding the relationship between Work Drive and Work Enjoyment. These inconsistencies led us to believe that the relationship between Drive and Enjoyment is most probably manipulated by indirect variables (mediators and moderators). In the current research, study 1 revealed that this relationship was near-zero, while in study 2 the relationship was significant and positive. However, in study 1, when we analyzed this association's multivariate level (as a part of the mediation hypothesis, H6, in contradistinction to the bivariate level, as in study 2), we found the relationship to be significant, implying WFC as a suppressor variable (see further analyses section). To elaborate on this matter, we reviewed the Work Drive items of the Work-Bat measure (McMillan et al., 2002), and noticed the Work Drive items have very little association (one item) with the time investment in work. However, a review of the Work-Family Conflict Scale (Netemeyer et al., 1996) revealed that the WFC scale does address, inter alia, the time-based conflict (Greenhaus & Beutell, 1985). It appears, therefore, that the Drive measure is lacking in terms of time investment, while the WFC measure includes such items. Consequently, we can deduce that there is a construct validity deficiency of Work Drive, obscuring its outcome's variance with ‘noise’. Hence, by including WFC in the model, this dimension adds the outcome-relevant variance to Work Drive, and suppresses the ‘noise’ derived from the inaccurate construct validity. By doing so, WFC contributes to the explanation of Work Enjoyment through enhancing the Work Drive's true predictive validity on Enjoyment itself. Such unique relationships between the variables are not to be discarded: retaining a suppressor variable in the model, though seemingly unintuitive, is a necessity for researchers worldwide (see Pandey & Elliott, 2010). See also future research section. In fact, regarding the relationship between Work Drive and Work Enjoyment (H1), we notice opposing results. Findings of study 1 imply that the association between these dimensions is somewhat spurious, as it is only significant in the presence of the suppressor – WFC. On the other hand, in study 2, we found a bivariate significant positive and moderate correlation between Drive and Enjoyment. Findings of the latter study support the notion that Work Drive may lead to positive experiences in work (e.g., Harpaz, 2015; Ng et al., 2007; Snir & Harpaz, 2012). Incongruently with H9, LMX diminished the relationship between Work Drive and Work Enjoyment. The drive to work and the enjoyment of working both stem from a single source, namely, the worker (e.g., Scott et al., 1997; Snir & Harpaz, 2012; Snir & Harpaz, 2015; Spence & Robbins, 1992). It appears that when LMX is high, there is a cardinal external source for positive experience, which “steals the show” for Work Enjoyment. As stated in the literature review, LMX may not be a unidimensional construct; however, it was measured as such in the current paper. As a result of the inability to distinguish between instrumental and emotional support of LMX, we might have limited our understanding of the reason such a moderation effect occurred (see future research section ahead). Regarding the bivariate relationships, hypotheses H2 and H3 were supported in our research, thus contributing the construct validity of emotional instability to the psychological-organizational literature. The strong relationship between Work Drive and WFC (H4) was supported in our research. The implication is that highly driven workers suffer from different types of conflicts (Greenhaus & Beutell, 1985): (a) time-based – since highly driven workers invest more-than-expected time and efforts in their work (see also Scott et al., 1997); and (b) strain-based – since highly driven workers keep thinking about work even when at home. As mentioned, individuals who experience hindrance-related stress (such as WFC) would feel strained and impaired in their work (Cavanaugh et al., 2000; Gilboa et al., 2013). This would lead them to have a less enjoyable experience at work, as demonstrated (H5). Furthermore, when management offers a worker a high level of autonomy, the Drive to overwork may lead to even more allocation of personal resources into the work process, leading to increased WFC, as demonstrated (H7). First, in both studies, there was a majority of women over men, which might bias the results in certain directions. According to gender role socialization and traditional gender roles, men and women may view their obligations toward their work and family roles differently (Eagly, 1987). Nonetheless, in a recent meta-analysis (Clark et al., 2014), there was no significant relationship between gender and workaholism, and gender did not even act as a moderator. This softens the limitation of gender confounding in our research, but we would recommend future studies to involve samples that are more gender balanced. Second, the data was gathered through self-report questionnaires (i.e., cross-sectional sample) and all the research variables were examined simultaneously. This methodology limits the ability to draw causal inferences from the results and limits the external validity. However, we conducted several statistical tests (e.g., Harman's Single Factor Test), which disprove this assertion (see Podsakoff et al., 2003). Third, we did not take into account the organization type (e.g., high-tech/traditional industries, services, public/private sectors) and the specific nature of the work itself (e.g., shifts, workload). These situational variables may have a significant influence on the expression of drive and/or enjoyment in work. For example, workers whose jobs revolve around content and who have ready access to digital devices, such as laptop and cell phones, have easy access to information. This makes their work far more enjoyable than, say, their counterparts working on a production line. Consequently, we would expect the manifestation of Work Drive among the content group to be enhanced. Terminologically, we have differentiated between Work Drive and Work Enjoyment. Through our studies, we have contributed to the existing literature on this subject and have established, theoretically, the order of precedence between Drive and Enjoyment. However, we did not examine the entire scope of Spence and Robbins's (1992) definition of workaholism (namely, the Involvement dimension), and therefore would recommend that future studies incorporate this additional dimension. The important role of LMX shown in study 2 amplifies the necessity to examine additional external variables in a similar fashion. Specifically, we suggest researching leadership styles, which reveal a greater effect on behavior than dyadic relationships such as LMX (see Sharoni et al., 2015). Moreover, there are additional situational factors to be considered, such as compulsive citizenship behaviors (CCB – coping mechanisms that transpire when employees contribute more to the organization, based upon management forcing the workers to invest more heavily in their work. Furthermore, as H9s results did not corroborate with the rationale we posited for it, a pristine necessity to differentiate between instrumental and emotional support of LMX relations arises. The LMX measure used in the current paper was unidimensional (Graen & Uhl-Bien, 1995), and it is highly plausible that sub-scaling it to instrumental vs. emotional supports may benefit future studies. Another area worthy of further research relates to the use of definitions. Terms that we used in our study that addressed the relationship between Drive and Enjoyment might have overlapped with other, related, concepts. For example, Work Enjoyment is very similar in nature to Work Engagement (Schaufeli et al., 2009). We would highly recommend conducting validating researches in this regard. Since we conducted our research and tested our models in the work context of Western society, we would suggest further validating our research cross-culturally since, as noted by Schaufeli et al. (2009), Work Drive and investments of both time and energy manifest themselves entirely differently in diverse cultures, specially between East and West. We would also recommend testing this model in a longitudinal study, for time might have an effect on our variables, their behaviors, and outcomes. It would also be very interesting to study further additional outcome variables relevant for the organization, such as burnout and organizational citizenship behaviors. As cross-sectional data may point to correlational associations, longitudinal studies may provide causal links between the variables. Finally, we recommend that future research focus on testing comprehensive models with regard to Investment in work as a mediator between the Drive and Enjoyment dimensions. This completes Spence and Robbins’ (1992) Work-Bat measure theoretically, due to the measure's lack of weighting appropriated to the dimensions of time and effort invested in work. In the workplace, as is known, individual differences have a wide impact on work (e.g., invested time and effort), and thus they must be taken into account in employee-related decisions. However, it seems that more attention needs to be given by management to the effects of, and the interaction between, internal and external factors, since these dimensions and manifestations can impact highly on organizational practices and interventions, such as HR, promotion, training. On the macro-level, we are aware of organizational cultures that nurture working for longer hours than the norm. These organizations show their appreciation in various ways. For example, employees working longer hours are perceived as “heroes” and displayed as role models (Shimazu et al., 2015). Such cultures may become triggers that activate the Drive disposition. Ergo, in situations where that Work Drive is “activated”, the organization should now consider interventions with certain moderators (e.g., LMX), in order for the worker to achieve Enjoyment, and not negative experiences (e.g., Oates, 1971). Paraphrasing on Taris et al.’s (2015) paper, an organizational intervention can turn the “beast” to a “beauty” or produce something “sweet” out of something “strong”. On the micro-level, managers play an important and responsible role in maintaining adequate inter-personal relationships with their employees. These relationships may serve to elevate employees’ enjoyment, as well as to raise their job performance. The results of study 2 support this contention and emphasize the importance of management (as an external factor, i.e., LMX) in contributing to employees’ experience at work. As such, there is great value in developing and maintaining soft managerial skills, which may improve the interpersonal relationships between the manager and the worker. Paradoxically, Job Autonomy – usually considered a positive resource – might actually harm the employee in some cases, as depicted in the current research (study 1). Therefore, autonomy should not be granted indiscriminately, but as the product of educated decisions related to employee characteristics, roles, and so on. On the same note, management often arranges flexible work aimed to improve the balance between employee's work and family areas. However, WFC is derived from several sources, one of which is strain-based. Now, work-driven employees feel compelled to work harder; but they also continue to think about work, even when not working. As such, highly driven workers should actually receive differentiated interventions that attenuate their flexible work schedules. This delimitation of autonomy should thus decrease their tendency to increase their investment in work and consequently decrease their WFC. It is imperative to emphasize an often not-addressed, and perhaps not well-known, issue in moderation testing. We would like to emphasize that testing for mediation requires one specific basic condition [among several] to be fulfilled, namely, that there is a direct link/association (or causal effect) of the predictor with the criterion. In the absence of a direct effect, there can be no mediation of this effect by any mediator variable (see Edwards & Lambert, 2007; Judd, Yzerbyt, & Muller, 2014; MacKinnon & Luecken, 2008; Preacher, Rucker, & Hayes, 2007; Vancouver & Carlson, 2015; Warner, 2013; Whisman & McClelland, 2005). Nonetheless, it was unclear in several of the aforementioned papers, and in a textbook (Warner, 2013), whether such a direct effect of a predictor on a criterion is required in moderation analysis, or the subject was addressed vaguely. All the authors mentioned and emphasized that moderation testing is based upon interaction analysis, a joint effect of both the predictor and the moderator variables on the criterion. Yet, none of the papers mentioned, in a straightforward and unambiguous manner, whether a direct effect condition is required. The only paper that came close to such a conclusion was Judd et al. (2014). The researchers stated that, “A model that estimates moderation is a linear model that estimates the effect of the interaction of two predictor variables on the dependent variable” (p. 31). Furthermore, Dawson (2014) concluded that the interaction term is the heart of moderation analysis, regardless of the main effects, respectively, of the predictor or the moderator. He stated that only when this interaction effect is statistically significant, can we assume that the moderator variable indeed moderates the relationship between the predictor and the criterion. Drawing on Dawson's (2014) work, we conclude that the interaction term is the sole purpose of such analysis and indicator of a moderation effect; the significance levels of the main effects (of the predictor and the moderator) are negligible. For Fun, Love, or Money: What Drives Workaholic, Engaged, and Burned-Out Employees at Work? An earlier version of this paper was presented at an annual meeting of the Eastern Academy of Management, where it was granted the Outstanding Paper award.